Rural-urban migration within China has transformed and reshaped rural people’s lives during the past few decades, and has been one of the most visible phenomena of the economic reforms enacted since the late 1970s. Whilst Feminist scholars have addressed rural women’s experience of struggle and empowerment in urban China, in contrast, research on rural men’s experience of migration is a neglected area of study. In response, this book seeks to address the absence of male migrant workers as a gendered category within the current literature on rural-urban migration. 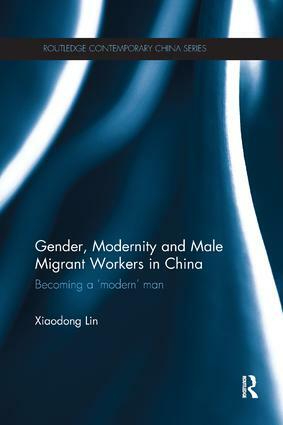 Examining Chinese male migrant workers’ identity formation, this book explores their experience of rural-urban migration and their status as an emerging sector of a dislocated urban working class. It seeks to understand issues of gender and class through the rural migrant men’s narratives within the context of China’s modernization, and provides an in-depth analysis of how these men make sense of their new lives in the rapidly modernizing, post-Mao China with its emphasis on progress and development. Further, this book uses the men’s own narratives to challenge the elite assumption that rural men’s low status is a result of their failure to adopt a modern urban identity and lifestyle. Drawing on interviews with 28 male rural migrants, Xiaodong Lin unpacks the gender politics of Chinese men and masculinities, and in turn contributes to a greater understanding of global masculinities in an international context. This book will be of great interest to students and scholars working in the fields of Chinese culture and society, gender studies, migration studies, sociology and social anthropology. Shortlisted for this year's BSA Philip Abrams Memorial Prize. Xiaodong Lin works in the School of Social Sciences at Cardiff University, UK.